Former Olympic triple jumper Phillips Idowu has been banned from driving after being caught in his car at more than twice the legal alcohol limit. 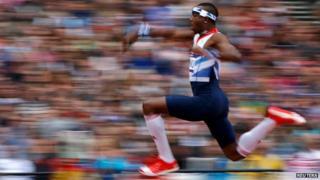 The 34-year-old, who won a silver medal at the Beijing Olympics in 2008, was stopped by Essex Police in his Land Rover in Epping on 20 September. Idowu, who admitted drinking and driving, was banned for two years by Chelmsford magistrates and fined £145. The hearing was told Idowu was on his way to a hotel when police stopped him. After the hearing, Essex police confirmed they had been called to a "domestic incident" at Idowu's home before his arrest. The court heard he failed a breath test, with a recording of 96 microgrammes of alcohol per 100 millilitres of breath. The legal limit is 35 microgrammes per 100 millilitres. His solicitor, Joanna Life, told the court he had been out with friends the previous night and returned home to bed. Ms Life said: "He just got in the car because circumstances forced him to leave the house in a hurry and he was driving a short distance." She said she did not want to elaborate on the exact nature of the incident, but added: "He planned to stay at hotel which was under a mile away to get away from the circumstances which had unfolded at the house." Ms Life said Idowu had co-operated with police and regularly helped charities and schools. He had no previous convictions, magistrates heard. Idowu, described by police as "unemployed", has no income and is currently living off savings, the court heard. He had asked to be fined rather than given community service as he had an employment opportunity abroad beginning next month, the court heard. Magistrate Jeremy Bachelor ordered him to complete 50 hours of unpaid work within the next 12 months.